I've been meaning to pick up Corpse Party, the "horror adventure" title developed by 5pb and Team GrisGris and published by Xseed Games, since its North American PSN release was announced last fall. Unfortunately, I can't even share with you a few early thoughts on this supposedly well-worth-the-price-of-admission game (according to numerous reviews, including this one by Anne Lee, aka the Chic Pixel blog's--and this blog's--apricotsushi) because, well, I've been taking care of my mom and dad for the past three weeks. Things are ever-so-slightly returning to normal in my life, though, so I'm going to do my best to give Corpse Party a go during our flight back to Seattle in a few days. Should I fail to do so, don't fret. I'll make sure I play at least a bit of it at some point in the following week--and afterward I'll publish some early impressions here. 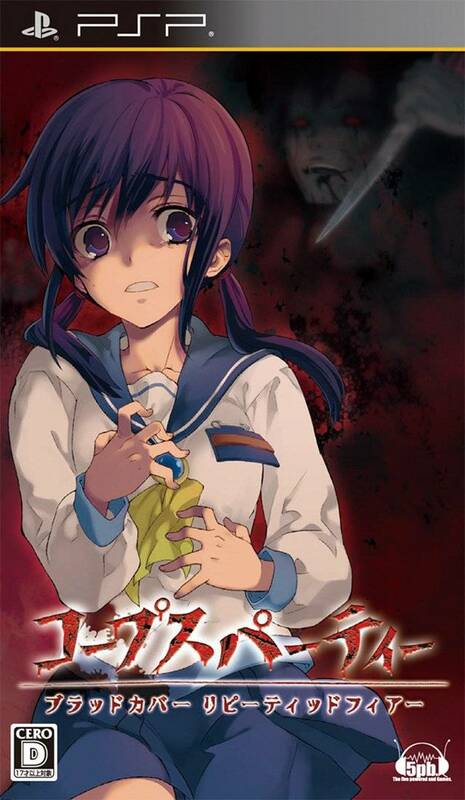 Have any of you played Corpse Party? If so, what did you think of it? Whoa. Can't wait to hear your impressions of what sounds like it could be a great game! Do you have a PSP, Simon? I have to imagine you don't, but you never know! Anyway, I've read such great things about this one that I just had to get it. I have played a smidge of it, by the way. I wrote this post on Friday, before we flew back to Seattle, and I played the game for about an hour while on the plane. Really liking it so far! I like how it creates tension even though the main graphics are just 16-bit quality. Anyway, I'll have further impressions soon, I promise! It's on my super long list of games to download on my PSP. I've heard really good things about it. I'm not very experienced with the horror genre, but the RPG styling of the game might help reel me into that realm of gaming. That surprises me, Simon! You don't have a DS, though, do you? As for modding your PSP so it can use emulators and the like: I've long meant to do the same to my PSP, but I've always been too scared to do so. Which is kind of funny, as I've had no problem modding my Wii! chaosyoshimage: I understand having a long list of "to buy" PSP games. My list is overflowing! Anyway, hope you're able to give this one a go soon. I'd love to hear what others think of it, too. Were you surprised that I picked up such a game, Matthew? Or were you just happy that I bought it? Regardless, I'm liking it well enough so far. Of course, I've only played about an hour of it. Will try to put some more time into it this weekend, if not before. haha, happy that you bought it. I've come to learn you have a wonderfully ecclectic taste in video games. No surprises here, I've still not played it. I however won't admit to owning too many games! Ah, that's good to know and hear, Matthew :) I suppose I do have a rather eclectic taste in games. Really, the only genre I don't much care for is the FPS genre -- and that's mainly because I can't stand the perspective. Anyway, I'll definitely let you know what I think of this one after I've played it a bit more. Ah, I thought so, Simon. You sure have an interesting mix of portables, I have to say. Not a Nintendo-made one among them! Anyway, I'd obviously highly recommend picking up a DS at some point. It's got one of the best game libraries of all time -- counting portables and consoles -- in my opinion. By the way, I did a neat little interview with Tom, the guy who translated the game, for VGW. It's definitely a better read if you've played through a fair bit of the game, but you should check it out once you've played more if you're interested. He talks about the translation process... It's very interesting. So it sounds like you've played about an hour? I know Brad "I hate everything" Gallaway couldn't stand to play it more than that ;) I hope the overabundance of screeching high school girls hasn't turned you off too much! I think after chapter 1 it really picks up. Thanks for mentioning your interview with the guy who translated Corpse Party. I'll check it out after I've spent a bit more time with the game. Don't want to spoil anything! Ha ha! I love your name for Brad :) Don't be too hard on him--he's probably been driven mad by Seattle's weather. I'm not using headphones, but maybe I'll start using them now. Also, I haven't been scared yet, but I definitely find the setting creepy and somewhat unsettling--which I like! I'll be sure to write up a post about my early impressions in a few days, OK? Looking forward to hearing more of your thoughts! Oh, that sounds cool--the 3D sound. I'll give it a try next time I boot up the game. As for Brad: Yeah, he can be grouchy sometimes, but I like that about him :) I can't imagine hating this game after just an hour, though--unless he just found it boring? I played it and loved it! (My review of the game) Was my second-favorite game of 2011. I'm a little stressed out by the sequences where you have to run away from something that will result in "Wrong End" if it touches you, but other than that I love the game! I've gotta say that I find the $19,99 price tag quite reasonable for the game, but then again, I'm used to German game prices and games that cost 60 USD cost 60 Euro ($78) over here - so I'm mainly pleased witht he digital game prices in the US. :> Except for Atlus' games, those could really use a price cut, $39,99 for a 2+ year old game is a bit high imo. I haven't played far enough to have to run away from anything yet, but I'm hopeful I'll get there this weekend. I understand what you're saying RE: game prices, by the way. And, honestly, I know $20 isn't too much for a full-fledged game, even if it is download-only, but I guess it's just a mental barrier I still have to get over. Thank you for following my blog, by the way. I just checked out yours and I am now following it, too. Glad to hear you're liking your Vita so far, by the way! BTW, I'm amazed that the Vita is the first system you've bought at launch. If you don't mind me asking: Why is that -- meaning, why haven't you bought any other system at launch?